1. DogGoneHandy is a locally owned and operated company, not a franchise. 2. All techs are employees of the company and have a minimum of 15 years experience, with the average being 18+ years for the entire staff. 3. DogGoneHandy is licensed in the state of Georgia with a General Contractors License. Learn more about state licensure on the Secretary of States website. 4. DogGoneHandy carries general liability, workmen's compensation, and builders risk insurance. 5. 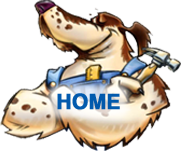 DogGoneHandy gives you peace of mind knowing that you are working with an established company (DGH is a division of Home ReBuilders which has been in business 31 years) that has vast experience performing repairs to all types of homes in all types of condition. 6. Decades of experience working with older homes that require special techniques and/or materials not readily available (our techs are experienced in fabricating wood trim that is no longer available). 7. Knowledgeable and friendly staff . . . our customer's satisfaction really does come first. 8. General trash disposal included in price (appliance disposal or large items not included). 9. DogGoneHandy provides job site protection to the work area before starting repairs (install dust curtains, plastic over furniture, install carpet protection, install hardwood flooring protection). 10. DogGoneHandy cleans up jobsite when job is completed. We like to leave it cleaner than we found it. 11. DogGoneHandy stands behind its work with one year parts and labor warranty.